Regardless of whether your shorted stocks are resulting in gains/losses, you will probably need to cover your position at some point. To begin closing your short position, click on the "Cover" link that corresponds with the short position that you wish to end. 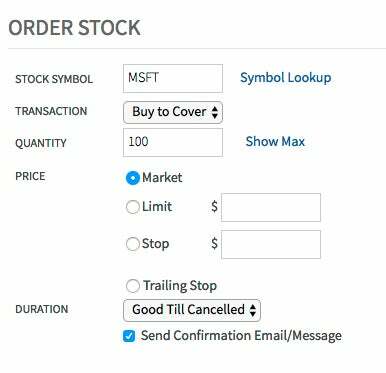 On the following screen, you will see the same "trade stock screen" that you are accustomed to seeing. Note that the Transaction drop-down box is now set to "Buy to Cover". From here, you can just continue clicking on the "Preview Order" button and the other sequential steps in order to submit the order to the simulator. Now that you understand how an investor can profit from short sales, let's discuss the inherent risk associated with short selling. An investor profits from short sales as a stock's price decreases, however, a stock's price can never go lower than zero. So there is a limited amount of profit you can earn from a short position in a stock. Conversely, if you take a long position in a stock, your investment can continue to increase in value many times its original cost over a long period of time. There is no theoretical limit to a stock's appreciation. However, this is of no benefit to an investor when they short a stock. In fact, this unlimited nature of a stock's upward movement means that an investor could theoretically experience unlimited losses if the short sale turns sour. If you are having difficulty understanding this, consider our example short sale of MSFT shares. Suppose there are two investors interested in MSFT stock, however one decides to buy (go long) 100 MSFT shares and the other shorts 100 MSFT shares. The investor who went long on MSFT can, in the absolute worst-case scenario, lose the entire value of their investment, or $7,000 ($70.00/share multiplied by 100 shares, not including brokerage fees). What can the investor who went short lose? To answer this question, let us suppose MSFT climbs to $100 per share. The investor who shorted MSFT, who made the same initial investment of $7,000, would lose $3,000 on their investment (or a $30 loss per share multiplied by 100 shares)! In theory, if MSFT continued to perform well the investor's short sale could amount to huge losses from a relatively small investment. This risky nature of short selling must be assumed (or at least dealt with by offsetting investments) by an investor, and as such is not recommended for novice investors. However, provided an investor understands the risks involved, short selling can be a valuable tool for earning solid returns - even in a bear market. With the stock reaching all-time highs and the company gambling on several new business lines, many investors may feel it's a good time to short sell Amazon.